Leaning forward, you strain to hear. The fresh, cool breeze of the garden morning brushes your cheek. Bending, you look into that open, black-dark mouth of the tomb, its only light the sun’s thin finger reaching past your shoulder to touch the corner of a bone box. But the bones for which it waits have changed, gotten up and walked away. No smell of death; only the sweet scent of burial spices hanging in the air. Bouncing off the walls of this vacated tomb, you may hear echoes from another garden where the lie, “Has God really said?” prevailed, and death was ushered in. But now, in this garden the lie has been silenced with a resounding, “Yes!! His Word lives!” and death has been driven out, the curse of Eden swallowed up in this empty space. And do you hear the echo of righteous Noah, who built a deliverance to carry God’s creations through the judgment, or Father Abraham, through whom all the peoples of the earth would be blessed? Do you hear the echoes of Egypt’s oppressive slavery turned inside-out in powerful salvation, and at its peak an innocent lamb slain so that death would pass over? Do you hear the echo of new life found through parting waters, or of bread, water, and the Shekinah tent given in a wilderness? Do you hear the death-dealing law, unable to give life, at once fulfilled and filled full by the Life? Do you hear these echoes? As you now kneel on this rough-hewn path leading into where Hope was dead for a moment, do you hear Joshua’s name, bouncing ’round these walls, the same name as “Yeshua,” “Jesus,” whose very name shouts “Salvation!”? Walls have crumbled. Evil has been judged, banished from the land. Joshua led God’s people to a promised place, a place flowing with all good things, as does now his namesake, who takes us to a promised rest harder bought. And the chaos of Judges too rings through this darkened grave, its “every man did what was right in his own eyes” now crushed under a staggering obedience, one Man having done what was right to give us new hearts, making us right with God. King David’s words, “You will not allow your Holy One to see decay,” hang in this sweet air, and His Son, the ultimate Man, the ultimate King, receives the coronation song and, finally, dominion of the world and of a different kind of Kingdom. And this Easter tomb, having become a temple of sorts, housing God, echoes with the words of blessing over Solomon’s temple, its walls now torn down but built up in flesh and bone, stone by stone, to go walking through the world, taking the Light of the Gospel, the Presence, to all the black corners of the earth. The temple decisively cleansed by one Offering, the Great High Priest intercedes, never to offer another sacrifice, the way into the holiest place forever opened by His trail-blazing life. Here too, in this now-hollow crypt ring full the words of Isaiah, “On this mountain … He will destroy death forever,” and Jeremiah’s “they will all know Me,” and do you hear Ezekiel’s bones rattle with hope? Exile having been exiled, this now is the true return, the Kingdom come, God’s people ruled by one ever-living King. A baby’s cry, warbling out from a dusty trough, warbles here too, for the birth of Salvation always was leading to death, thus to this place. Vulnerability led to and ended here. The Jordan with open sky and loving Voice, the temptation to bow down, gain dominion, and avoid the terrible fate, and the transfiguration, shining and telling of his Exodus — events that all anticipate this shaking of the earth, this shattering of our assumptions. Echoed in every inch of this tomb are Love’s words, “no greater love,” and Love’s power that shushed a storm and raised a child. You hear them here in this cavernous glory. And now you turn looking from this garden to the outpouring, the Spirit come, and to the church spreading down the ages, and to those who die in Hope, and you see us. For all these echoes from the Easter tomb, you realize, are our Story, and we, at the mouth of this conquered grave, stand at the center of His Story. Part of the curse Jesus would bear for us on Golgotha was the taunting and testing by God’s enemies. As he drowned in his own blood, the spectators yelled words quite similar to those of Satan in the desert: “Let the Christ, the King of Israel, come down now from the cross that we may see and believe” (Mark 15:32). But he didn’t jump down. He didn’t ascend to the skies. He just writhed there. And, after it all, the bloated corpse of Jesus hit the ground as he was pulled off the stake, spattering warm blood and water on the faces of the crowd. That night the religious leaders probably read Deuteronomy 21 to their families, warning them about the curse of God on those who are “hanged on a tree.” Fathers probably told their sons, “Watch out that you don’t ever wind up like him.” Those Roman soldiers probably went home and washed the blood of Jesus from under their fingernails and played with their children in front of the fire before dozing off. This was just one more insurrectionist they had pulled off a cross, one in a line of them dotting the roadside. And this one (what was his name? Joshua?) was just decaying meat now, no threat to the empire at all. But sometime before dawn on a Sunday morning, a spike-torn hand twitched. A blood-crusted eyelid opened. 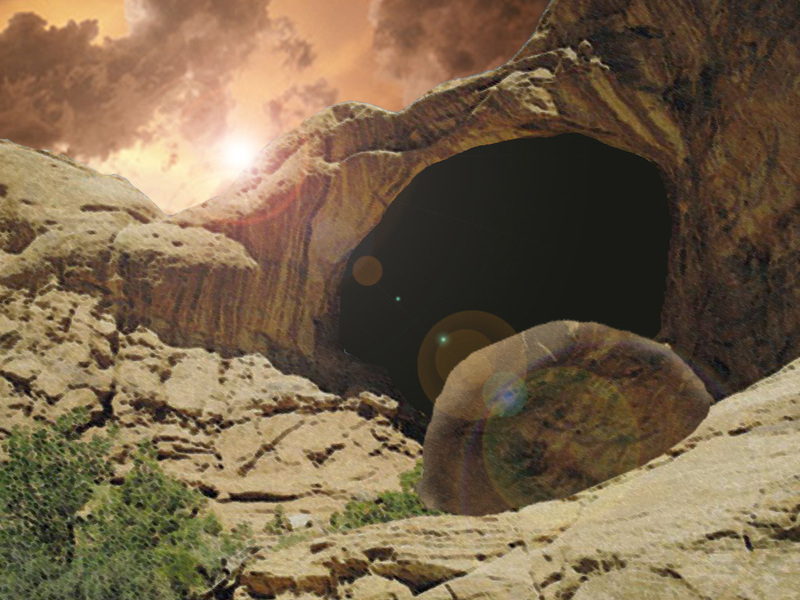 The breath of God came blowing into that cave, and a new creation flashed into reality…. The following is my favorite excerpt from: Tempted and Tried: Temptation and the Triumph of Christ by Russell Moore, Crossway, 2011. pages 124-125. Society conditions us to believe life is about a nicer house, a prestigious high paying job, and granite countertops. Yet when you are faced with the reality that you only have one week to live those things you use to covet, fear, worry about, or fixate upon take a backseat to what’s most important. I would quit my job, buy a boat and get a tattoo. I would get married as quickly as possible. I would travel by helicopter to Ireland, the Grand Canyon, and end at a beach spa on Bora Bora. I would pig out on all the cheese fondue and chips and guacamole I could stomach. I would max out my credit cards and spend it on frivolous things like renting a convertible Ferrari. I would write letters to all my children or people who touched my life and spend time with them. I would go out and get a second opinion from another doctor. Today is Palm Sunday. It is the day we celebrate the beginning of Jesus’ last week of earthly life. Within a week He is praised by the crowds, lynched on a cross, and raised from the grave. Like Ben, Jesus knew He had one week to live. What do you see Jesus do differently the last week of His life compared to the 33 years before? Nothing. 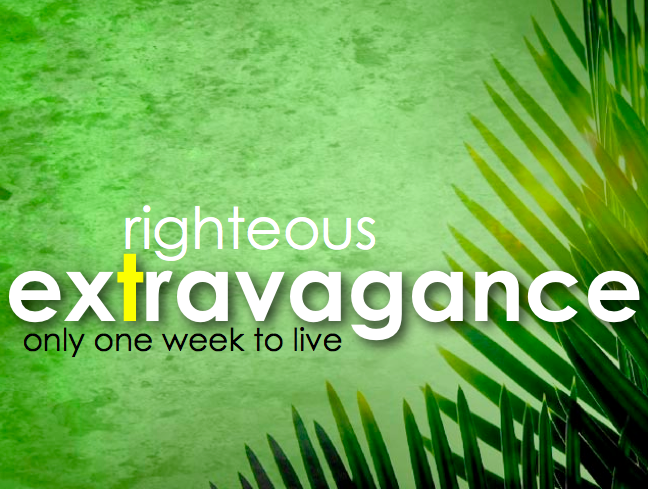 What you do see is an expectation of His followers to live extravagantly the remaining days of their earthly life. Not extravagant, as in spending frivolously or living recklessly, but extravagant as in living out your faith with excessive elaborateness that people are sure to hear and see the Savior in your speech and actions. Within 6-days Jerusalem will celebrate the Passover. People are flocking from all over the region. This Passover will be different. Jesus will die. He will become the Passover lamb. Jesus is moves towards danger not away from it. He does not hide. In fact, He goes to the Bethany—the location of one of Jesus’ greatest miracles—the resurrection of Lazarus. He knows His time is near. The chief priests and Pharisees have already sent out a warrant for Jesus’ arrest [11:57]. The time comes when Mary presents Jesus with an extravagant gift. Perhaps the whole family planned this moment. Perhaps they pooled their savings together to buy the gift fit for a king [Songs 1:12]. Perhaps it’s a family heirloom that has been passed on for years. Or perhaps Mary heard about the “sinful woman” at Simons house who poured perfume at Jesus feet and also desired to honor Jesus [Luke 7:36-50]. We are uncertain her reasons, but Mary poured out about 11 ounces (the size of a soda can) and anointed the feet of Jesus and wiped His feet with her hair. The fragrance filled the house. It’s an unforgettable moment of extravagant worship from hearts filled with gratitude. Not all who were at the party thought Mary’s scene of extravagant worship was such a wise idea. Judas Iscariot thought it was a waste of good perfume. And as if he were ‘Mr. Spiritual’ asks why the expensive perfume was not sold and given to the poor. This is quite the blow coming from the tightwad who is robbing from the disciple’s moneybox. If Judas wasn’t over exaggerating the 11-ounce flask of spikenard was worth about $26,000 (300 days pay at minimum wage). Judas makes us aware that it is easy to be the judge of another persons worship, rather than just worshiping Christ. His values were so deeply different from Mary and Martha and Lazarus’ that in a few days he would do the opposite. Instead of giving $26,000 for Jesus he would sell him for a thousand bucks (30 pieces of silver). Judas’ heart is full of dollar signs, but Martha, Mary and Lazarus’ hearts valued what money could not buy, a relationship with God. What do you treasure? If you treasure the things of this world you will hang by them, as did Judas. If you treasure Christ above all things you will live. Jesus said to Martha after He raised Lazarus, “I am the Resurrection and the Life. Whoever believes in Me, though he die, yet shall he live, and everyone who lives and believes in Me shall never die.” [John 11:25–26] Jesus wants to make sure that in six days at another grave—His own—they do not lose their sense of worship that He is indeed the Resurrection and the Life, but that they would “keep it” even on the day of His burial. According Romans 3:23, “All have sinned and fallen short of the glory of God.” But Jesus has come to live to die so that you might give Him “praise for His glorious grace” now [Ephesians 1:3-14] and throughout all eternity. He came to be worshiped. He created you as a worshiper. And He has called you to make worshipers. Worshiping God is your mission. Palm Sunday was an event of great understanding and misunderstanding. The great understanding is that this Jesus really is “the King who comes in the name of the Lord” [Luke 19:38]. He is the Messiah, the Son of David, the long-awaited Ruler of Israel, and the fulfillment of all God’s promises. But the great misunderstanding was that He would enter Jerusalem take His throne and make Israel free from the oppression of Rome. First, Jesus makes a kingly entrance. Why did Jesus choose a donkey? It demonstrated Jesus’ humbleness; and it showed that Jesus’ entry was part of God’s plan [Zechariah 9:9]. During Jesus’ day, donkeys were part of the peasant life. However, Hebrew kings rode the ‘beasts of burden’ when they traveled throughout their kingdoms in times of peace [1 Kings 1:33–35]. And the king always had a donkey reserved for him that no one else had ever ridden. Second, the people proclaim Jesus as king. Not only are the people singing Messianic psalms. According to Luke 19:35–36, the people spread their cloaks on the donkey and the road. Cloaks were of great importance. The cloak was so important to the owner that it would never have been loaned out to someone else. Compare it to something important to you like your home, car, or favorite dress or suit. Hence the parable when Jesus says when one asks for you tunic, give him your cloak as well [Matthew 5:40-42]. The disciples did not understand the purposes of the events that day, until after Jesus death and resurrection. Now the Pharisees completely misunderstand what is happening. Their pride blinded them, and they refused to bow to Jesus ‘the blasphemer.’ In disgust they mumble to each other, “Look, the world has gone after Him!” [12:19] In the crowd, Greeks gathered with the join the crowd, which is ironic proof that the world had come to see Jesus. The idea of world (kosmos) in John is not a negative term [3:16–19]. Neither is it just geographical, but it’s a reference to the population or people of the world. Jesus is called the light of the world [1:9; 8:12] and “the Savior of the World” [4:42]. His coming into the world [1:10] was to take away the sin of the people of the world [1:29]. But because of hard hearts and rejection, the coming of Jesus also meant the judgment of the world [9:39]. This is sobering news for Jerusalem. But it made way for the good news to reach the ends of the earth [John 3:16]. In Luke 19:39 the Pharisees ask Jesus, “Teacher, rebuke your disciples.” But He answered and said to them, “I tell you that if these should keep silent, the stones would immediately cry out.” [Luke 19:40] How can stones cry out that Jesus is Lord? All nature, just by being, testifies about the God who made the world. Do you remember pet rocks? Companies must have made a millions selling rocks with felt feet and beady little eyes. It’s silly to think that a rock could talk, much less shout the praises of Christ. But if you’ve ever been to the Grand Canyon or the Rocky Mountains, you realize that the rocks do cry out praises to their creator. All of His creation makes His presence and praise known. Why would mankind, the crown of His creation, choose to be silent? He’s called you to be His witness to the world! These verses mark a turning point in Jesus ministry. He sounds the alarm saying, “My hour has come that the Son of Man should be glorified.” Using an agricultural story of a dying seed that gives life to the following years harvest, so Jesus must die in order for the world to have eternal life. Only by understanding Jesus’ death and resurrection can you make sense out of what seems to be the senseless waste of life. Jesus will sacrifice His life so that all may have life. Jesus is not just talking about Himself but is giving a template for everyone of His followers. Following Jesus may involve the ultimate cost of discipleship, namely the death of the disciple. There are hard things in these verses for Jesus followers. It is not easy to die to sin and self, hate you life in this world, follow Christ, and serve Him. But there are glorious things for followers who do hard things for His name sake. If you die, you bear much fruit. If you hate your life you will keep it for eternity. If you follow Christ you will be where He is and He will be there too. And if you serve Christ the Father will honor you. If you had 7 days to live how would you make His name known? How would you spend and be spent for the sake of His fame? The way you live the last week of you life reveals your priorities or what you value. When Martin Luther was asked what he would do if he knew when he would die he responded, “If I thought the world were going to end tomorrow, I would plant a tree.” He gets to the heart of the matter, that when the end comes the Lord should catch you doing the things you were called to do all along. Mark was part of a team of two families serving Muslims. Late in August, the team received death threats. The families were evacuated, but Mark stayed for one last meeting with believers before joining them. The night after the meeting while at home preparing his dinner, Mark was shot. He was discovered the next morning in his home, but he had lost too much blood to survive. At his passing, Mark left a young wife and two infant twin daughters. Mark’s agency feared the possibility of legal action from Mark’s father, who was not a believer and who vocally opposed his son’s service among Muslims. But at Mark’s funeral, Mark’s father was among fifteen people who gave their lives to Christ. His wife plans to minister in the same region where her husband was killed. I think of the five men who lost their lives in Ecuador to reach the Auca Indians. A wife and a sister returned to the village and the wife raised her daughter among the tribe that killed their husband. Many in the tribe converted because of the similarity between Christ sacrifice and the five men. The risk versus rewards for extravagantly following Christ is literally out of this world. You are guaranteed to be an heir of everything that God has created and eternally be at home with Him. God is lavishly, excessively, exuberantly, graciously, outrageously loving. In a word, He is extravagant. When His extravagance registers in your hearts and minds, extravagant devotion flows towards Him. What do these names have in common? Marilyn Monroe, Frank Sinatra, John F. Kennedy, Abraham Lincoln, Babe Ruth, J.R.R. Tolkien, Beethoven, Mozart, Elizabeth Taylor, and Michael Jackson. The only thing in common among all the names is that they are all dead. Now if I were to add the name “Jesus” to this list would it change your answer? Jesus died, but He didn’t just die—He conquered death. He conquered death through His resurrection. There are many modern attacks on the truthfulness of Christ’s resurrection. Have you watch documentaries on the Discovery Channel or History Channel that dispute the facts of the resurrection? There are also many books like The God Delusion [Richard Dawkins], God is Not Great [Christopher Hitchens], or the popular book The Da Vinci Code [Dan Brown] that do not buy the idea of the resurrection of Jesus. Some people think Jesus disappeared to Hawaii where Elvis, Hitler and JFK are all hiding out in a bunker playing poker. Others seem to think that Jesus was swooned or asleep; He couldn’t have been dead and then resurrected. How would you address theses attacks? What difference does it make if Christ had a bodily resurrection? Without a bodily resurrection all of Jesus’ claims would be false and followers of Christ would have no hope of eternal salvation. 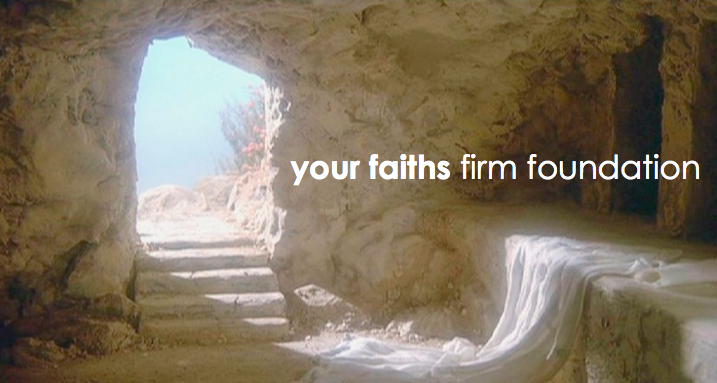 His resurrection is the foundation of the gospel and your faith. Without the resurrection of Jesus Christ, Christianity and its core truth claims would not hold any weight nor would your faith. Paul faced a similar situation with the church that he planted at Corinth. Gospel. What comes to mind when you see that word? Gospel literally means “good news” or “breaking new.” Before discussing the good news, let’s discuss the bad: You deserve death; there’s nothing that you can do to earn salvation because sin condemns you to eternal death and separation from God. But the Good News is the gospel! What is the gospel? The good news is that God loves His creation so much that He came down from heaven for you [Philippians 2:5–11], lived for you [John 14:19], died for you, and rose from the dead for you [Romans 4:25]. And if you respond through repentance of sin and have faith in Christ, He blesses you with eternal life [John 3:16]. Paul says that you must “take your stand” on the gospel. What does he mean? You must base your life on its truth [cf. 15:58]. By taking a stand for the gospel you are demonstrating confidence in both the Messenger and His message. When Paul said, “by this gospel you are being saved,” he wasn’t speaking about something just in the past but something present too. The idea that one is “being saved”—while salvation is instantaneous—means you can still experience the power of the gospel on a daily basis. How is your life different since you became a Christian? Today you can experience the gospel in your decisions, your relationships, your school activities, your work, and your life—right now. The gospel not only changes your future destiny, but your present realities. What do you think Paul meant when he said, “Otherwise, you have believed in vain”? He was emphasizing that true faith endures over time. In Hebrews 3:14 it says, “For we share in Christ, if indeed we hold our original confidence firm to the end.” An enduring commitment to the gospel shows genuine faith in Christ. Real followers of Christ do not give up when life gets hard, or doubts come like a flood, or you just don’t feel like following today. The detective shows on TV [i.e. NCIS, Monk, Psyche, etc.] solve cases by following evidence and eyewitnesses, and that’s what Paul did too—he followed evidence of the dead and of the living. When Paul referred to the witness of the dead; he read the prophets from long ago who foretold what Jesus would accomplish. Can anyone say with confidence who will be the president of the United States in 20 years? Who will be the hit band or movie star in the year 2145? Prophets foretold in detail Jesus’ birth, life, death, and resurrection hundreds of years beforehand. Fulfillment of Old Testament prophecies: Genesis 3:15 (the seed of the woman will crush the serpent), Genesis 12:3 (the seed of Abraham will bless all nations), Psalm 2 (the supremacy of God’s Son), Psalm 22 (the description of His death), Isaiah 7:14 (the virgin birth), Isaiah 9:6 (the deity of the Messiah), Isaiah 52:13–53:12 (the specifics of His death, including taking on our sins), Isaiah 53:11 (His resurrection), Micah 5:2 (the place of His birth), and Zechariah 9:9 (His entering Jerusalem on a donkey). These prophecies show us that Jesus is God and Savior. Paul adds another line of evidence—the evidence of the living. What effect do eyewitness testimonies have on a court case? It usually serves to prove or disprove an event. In 1 Corinthians 15:5–8, we see other eyewitnesses to Jesus resurrection: Peter, the Twelve, more than 500 others, James, the apostles, Paul himself. Why do you think that Paul emphasized the testimony of these eyewitnesses? Eyewitness testimony is always more powerful than secondhand information, and some of these were still alive and could tell their stories [one eyewitness could be duped, but over 500?]. Both the living and the dead come together to build a case for the resurrection of Christ. Let’s say I had a mystery bag full of food. Without knowing what it was would you be willing to try it? No body wants to be the first one to try it. This is like what Christ did. He tasted death, so you would have to be afraid. His death and resurrection give you hope. Paul calls Christ the firstfruits. This phrase has its roots in the Old Testament, usually refers to the Jewish practice of offering the first of a crop to the Lord in recognition that the entire harvest belongs to Him [cf. Leviticus 23:9–14; 1 Thessalonians 4:14–17]. During the Feast of Unleavened Bread, the priest waved the firstfruits of the harvest before the Lord, and a perfect lamb was sacrificed [Mark 14:12]. Jesus’ death and resurrection occurred during the Feast of Unleavened Bread. 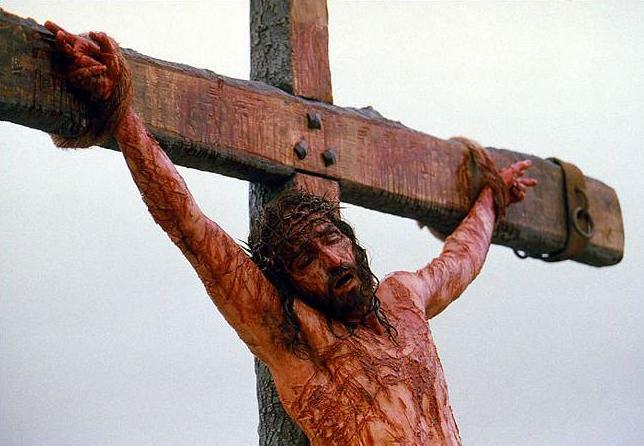 Jesus Christ was the perfect Lamb of God who was sacrificed to pay the price for your sins. His resurrection was a sign of the future resurrection of all believers. Jesus’ bodily resurrection is the heart of the gospel. Because God raised Jesus from the dead, the hope that you have in Him is certain. The evidence for Christ’s resurrection is clear. You can be confident in your faith. Make know the reality of His resurrection as you live out the gospel. Many times in His earthly ministry, Jesus brought hope to hopelessness. Every day, you see people who feel hopeless and need the gospel. Paul wrote a letter to the Corinthian church to remind them of the gospel. Write a letter to someone who needs to hear about the resurrection. Instead of writing what they need to do, tell them what you know about Jesus—and how the gospel has impacted you. Take ownership of what you know; write to encourage others in the gospel. Why is Easter so significant? So what? Why is Easter so significant? The simple answer is: God conquers sin and gives you a means to eternal life. We tend to get lost in the bigness of life and we question what one person can do. We hear about the billions of people who roam this planet and it boggles our minds. There are nearly 7,000,000,000 people on this earth. That is a lot of zeros. How could anything significant or generationally impacting can from one man’s work? Oh, but without that One Man there would be no billions of people. One man plunged mankind into sin. One Man brought salvation to humanity. By one man death come upon all. Through One Man came grace to eternal life. The resurrection of Jesus from the grave is eternally significant. It is the central theme and climax of the gospel [Matthew 28:1-10]. Without Jesus’ resurrection I have no hope of resurrection to life either. 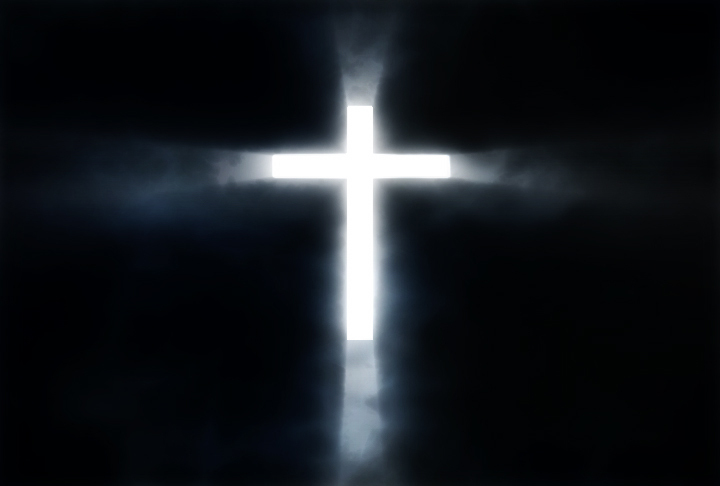 In order for Jesus to rise He had to die [1 Corinthians 15:1-4]. This is the message and truth of the gospel. I would therefore conclude that the resurrection of Jesus Christ, which we celebrate each Easter is eternally significant. Do you know Him? What if Jesus never came? Or instead, accepted immediate fame? What if He never walked this earth? And purposed to die from birth? 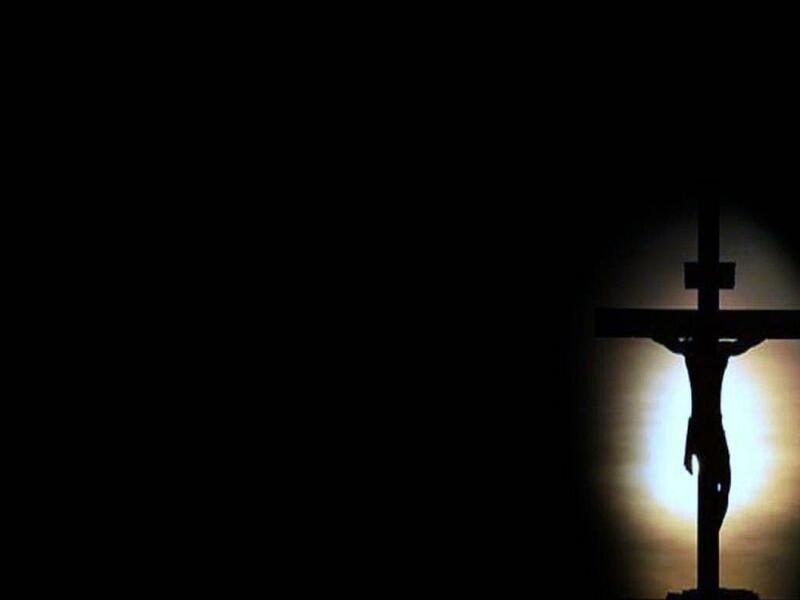 What if Jesus never willfully died? And lived a ludicrous lie? What if He never became the sinless sacrifice? And tumbled in temptations vices? What if Jesus never bore God’s wrath? And became righteousness on my behalf? What if He complained and moaned? And left my sin unatoned? What if Jesus copped out of the crucifixion? And put a pause on propitiation? What if to Him redemption did not matter? Or withheld glory from His Father? What if Jesus decided not to save? Or remained hidden in the grave? What if He failed to rise again? Or reconcile mankind from within? Demonstrating and redefining a Good Friday. I love this time of the year, especially these next two weeks. It is such a “fresh” and “lively” time of the year. Spring. It’s warm from the sun shining, flowers are budding, birds are chirping, and people are out-and-about. Easter. It’s about celebration and reflection of the One I call Savior who sacrificed His life for me. He still lives.